Crab legs are wonderful. Octopus is delicious, or at least its texture is fun. Turkey is fine, and it’s difficult to avoid this week. 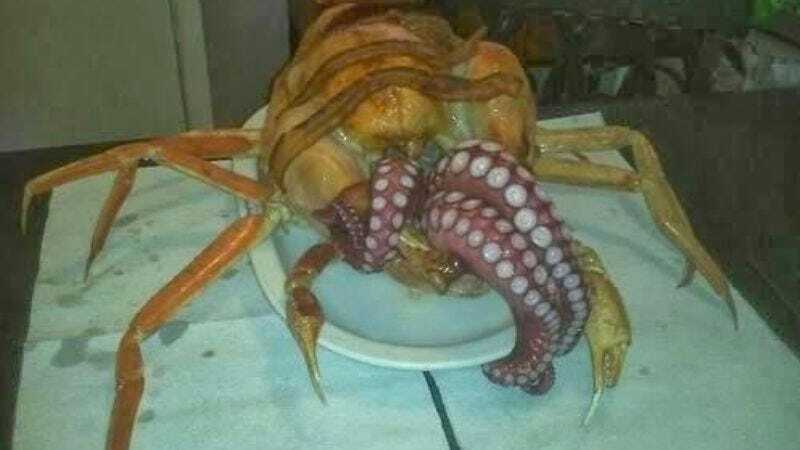 However, Thanksgiving is a time to pair seemingly nice things—such as extended family and alcohol—and marvel at the ensuing abominations. It was perhaps in this spirit that all of the above foods were assembled, presumably high atop a thunderstruck mountain by cloaked men, and dubbed the c’thurkey. It is—well. It is. Let’s just leave it at that. The c’thurkey originally made the rounds several years ago, and is the creation of a database administrator from Texas named Rusty Eulberg. It is obviously a riff on the famous turducken, which stuffs a series of increasingly large birds inside each other. Elsewhere, turkeys have been wrapped with bacon, stuffed with White Castle burgers, and rendered into a variety of both sweet and savory cakes. Here is a teddy bear stitched out of raw turkey meat, which is probably not exactly edible, but hey, it exists. Just like the c’thurkey. Somewhere, right now, it chitters.